SIDENOTE: This is (hopefully) to be the first in a weekly series through July, reviewing classic films that often get brushed under the rug. Enjoy and encourage! A triumph! A cinematic breakfast snack of some kind! As renowned actor Ciarán Hinds said in a January 2011 interview with The Wall Street Journal, movie heaven is “anything with James Stewart or Cary Grant, plus regular doses of Singin’ in the Rain.” What that wonderful man seemed to forget was most of the MGM musicals, even before Arthur Freed’s arrival at the studio, are enjoyable romps that, at the very least, come close to the glory that is Singin’. The film in question for this week’s lesson is one that, in this reviewer’s eyes, equals it — Broadway Melody of 1940. The final completed film in MGM’s Broadway Melody series, 1940 strikes a tone that seamlessly blends Leopold Stokowski, Glenn Miller and Spike Jones in a bright and joyous trip down Melody Lane. Two down-on-their-luck dancers, Johnny Brett (Fred Astaire, Holiday Inn) and King Shaw (George Murphy, later a California Senator) are both dancing for peanuts and actively avoiding the long arm of the IRS when talent agent Bob Casey (Frank Morgan, The Wizard of Oz) asks to meet with Brett, the better of the two dancers. However, Casey doesn’t know Brett from another, and when the latter mistakes the former for a tax collector, Brett introduces himself as King Shaw. In the days to follow, the actual Shaw accelerates to the top of the dancing world, gaining ground with Clare Bennett (Eleanor Powell, TV’s The Faith of Our Children), a rising dancer whom Brett is quite sweet on, causing a rivalry that builds as many bridges as it burns. 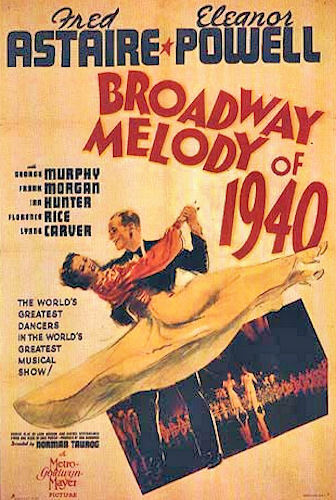 Truly, 1940 is the first of my viewing any of the Broadway Melody series, but unlike The Big Broadcast, Paramount’s competing series of yearly musical revues, MGM’s is focused on telling a story first, whereas Paramount seemed to build up the ensemble and songs first, then tack on a story to link them all together. The difference between them is akin to Yeston & Kopit’s Phantom and Lloyd Webber’s The Phantom of the Opera — one expounds, the other extends. That being said, 1940 is cute, fluffy stuff that makes one laugh and cheer at all the right moments. Astaire is in fine form, as usual, in dancing up a storm and, on occasion, singing sweet tra-la-las between taps. He also brings a fair amount of pathos in playing Johnny Brett, clearly jealous of his partner’s rise to fame and quite angry at himself for giving Shaw’s name to Casey. Powell, purportedly one of the few dancers who could out-dance Astaire (causing him to fear her), performs on equal footing with her leading man, and they share some impressive routines together, from a tap number in a café to a luscious Harlequin masquerade waltz toward the end of the second act. As for Murphy, the only thing I had seen or heard of his work was a bitingly funny song named after him, composed and sung by Tom Lehrer, so while it feels wrong to criticize him, I will say this: he is no Astaire or Powell, but anyone who can keep up with either of them in a number is respectable in that regard. Morgan gets some of the best gags I have seen in a musical revue, usually having to do with the absurd talent he attempts to bring in for his shows, the best of which is a thoroughly mutilated take on Il Bacio akin to a performance by Spike Jones and his City Slickers — I want more.